Why Are Trees Important to the Ecosystem? Plants use energy from light to convert water and carbon dioxide into sugar and oxygen in a process called photosynthesis. Chlorophyll, the green pigment in leaves, absorbs sunlight and uses the energy to convert six molecules of carbon dioxide and six molecules of water into one molecule of sugar and six molecules of oxygen. Plants use the sugar to grow and release the oxygen back into the atmosphere. They also help regulate the amount of carbon dioxide, which is one of the most important greenhouse gases, in the atmosphere. Plant leaves have small openings, called stomata, all over their surfaces. The stomata open to absorb the carbon dioxide needed to perform photosynthesis. They also open to release the oxygen produced by this process. Plant roots and leaves absorb water, which reacts with carbon dioxide using energy from light as the catalyst. Plant leaves are also able to absorb and release water through the stomata. Carbon dioxide is a greenhouse gas. It traps heat in the atmosphere, causing the greenhouse effect that contributes to global warming. According to the U.S. Environmental Protection Agency, U.S. greenhouse gas emissions have been steadily increasing; in 2010, U.S. emissions totaled more than 6 billion metric tons of carbon dioxide equivalent. Carbon dioxide is released into the atmosphere when fossil fuels such as natural gas, coal and fuel oil are burned for energy production. Planting trees and other vegetation can help reduce the amount of carbon dioxide in the atmosphere. Every year, the earth’s forests are able to absorb one-third of the carbon dioxide emitted by burning fossil fuels. 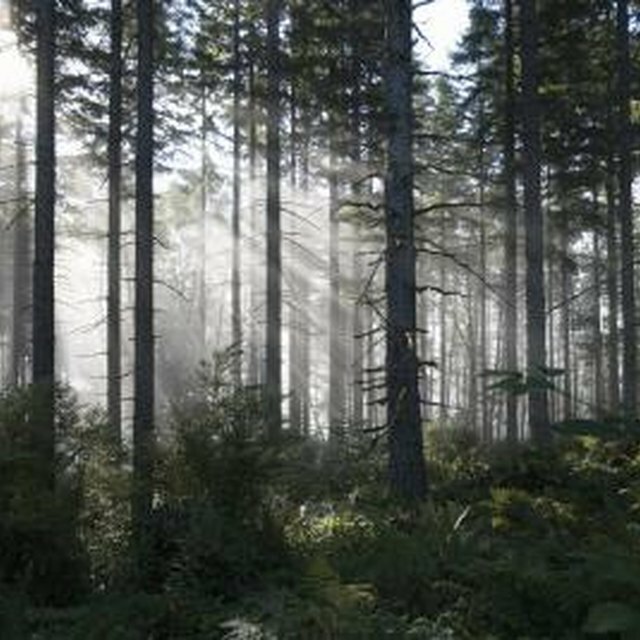 Forests act as carbon "sinks" and reduce the amount of carbon dioxide in the air significantly. A study by the United States Forest Service found that tropical forests absorb more carbon than forests in temperate or boreal regions. However, tropical forests are disappearing as developing countries replace them with commercial centers and pasture for livestock grazing. One of the harmful side effects of deforestation is an increase in atmospheric carbon. Deforestation increases atmospheric carbon dioxide in two ways. Machines that cut and process logs emit carbon dioxide, and cut trees that remain on the forest floor decompose, which releases more carbon dioxide into the atmosphere. The United Nations, through its Intergovernmental Panel on Climate Changes and UN-REDD -- Reducing Emissions from Deforestation and forest Degradation -- program, works to discourage deforestation in developing countries. The REDD+ program provides financial incentives for developing countries to reduce deforestation by assigning financial value to forests’ carbon-storage capabilities. Cairoli, Sarah. "How Is Carbon Dioxide Absorbed During Photosynthesis?" Sciencing, https://sciencing.com/carbon-dioxide-absorbed-during-photosynthesis-3196.html. 10 April 2018.